I drove by the cargo truck in time to read the words Orion and see a group of people shimmying into wetsuits, prepping to get soaked. I didn’t have any plans, so I promptly hit the breaks and reversed back to a young woman who looked like she was in charge. “You guys got any room?” I probed. She told me that as long as I called in to check with the office, paid, and was ready in 10 minutes, I could hop in a raft with them. That was all I needed to know. I called and got the OK from the voice behind the phone, which just so happened to be that of James Moore, the owner of Orion who founded the company 35 years ago. And just like that, I was standing in a line with a group of strangers hearing the safety instructions from Lizzie and Jenn, prepping to face rapids in an a big inflatable raft for the first time with a couple from Houston and a family of five from Toronto. Only 45 minutes prior, I’d rolled out of bed to the roar of the Skagit River, hidden by rows of trees from my campsite. I’d dipped past some branches and found myself standing on a rocky beach staring at the river—calm but powerful. Now, I was about to ride down the river that gently welcomed me to the day not long ago. I was a little nervous, but the instructions from the guides sounded clear enough. And then, we were off. If you’ve never floated a river, it’s a humbling and peaceful experience. You’re at the mercy of something very strong that’s all around you, rumbling, yet the flow of the water and the scenery surrounding you are so cathartic that you almost forget how dangerous the river can be. And so you float down in that balance…until you approach rapids, where you either get really excited and/or go to the bathroom in your pants a little bit. The Skagit was just right for a beginner. It was calm often, but the rapids were challenging without being such that made you want to let off a high-pitched scream. 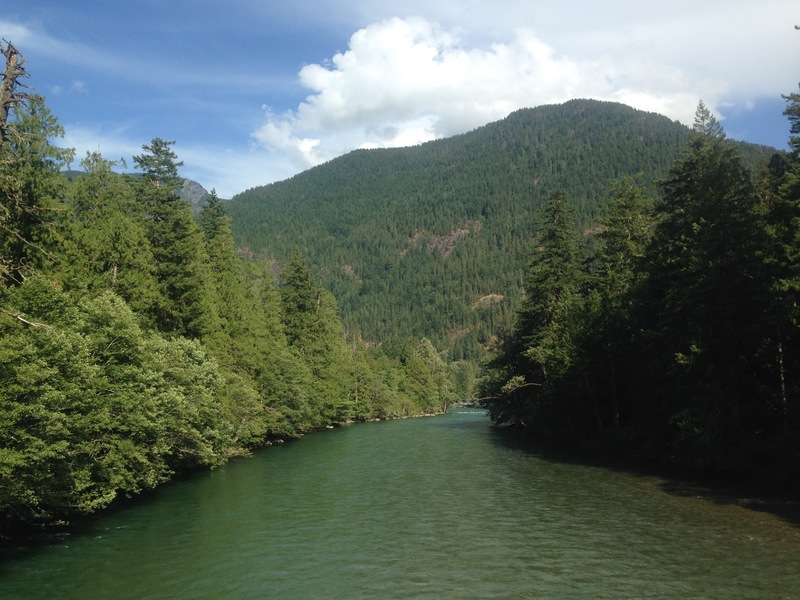 After two or three hours quietly paddling by bare mountains skirted by evergreen forests, we veered out of the current and beached at the end of our run. Nevermind the fact that we stopped to jump off rocks, played balance games when water was calm, and had some particularly deep conversation, the time on the water when we were just able to sit and think was probably my favorite. There’s something unique about being in nature, it just opens your mind to be able to think clearly like never before. And Orion facilitated this with gusto—the right amount of everything, which is what you’d expect from a company started by Moore over 30 years ago as both a way to get outside and enjoy nature with others. I appreciated my time so much, I called Moore to thank him and ask more questions. And the most interesting thing he told me was that his favorite time on the water is still the week-long trips he leads to train his new guides. That’s something that is clearly translated from that care into time on the water with his guides. They’re the right mix of fun, introspection, and technical know-how. Relaxed, but focuse in a way that doesn’t stress you out. Moore and his Orion all-stars lead trips in rivers all over the Pacific Northwest, but from what I can tell, they mostly frequent the Wenatchee, as well as the Skykomish, Sammamish, Skagit, Methow, Tieton, and the Deschutes. But they apparently lead many private trips per the preference of the clients, which sounds just about right to me. If you’re headed to the Pacific Northwest, I’d encourage you to check out a river trip with Orion—the longer the better. And if their OK website doesn’t satiate your need for information, just give them a call to chat. Trust me, you’ll be glad you did.